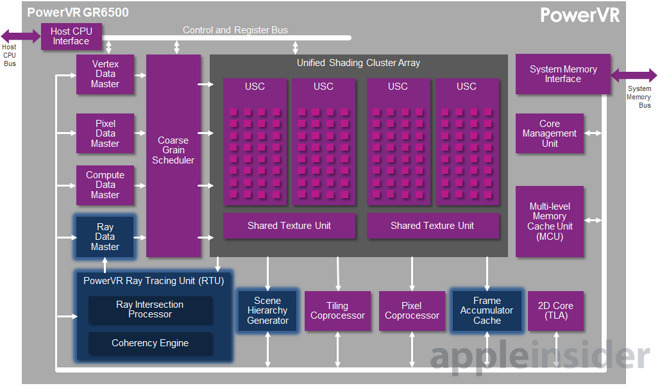 Imagination Technologies, the developer of the PowerVR graphics processing cores that drive Apple's A-series processors used in iOS devices, has demonstrated a new mobile engine at CES with the ability to perform realtime ray traced 3D graphics rendering, likely destined to appear in Apple's future products. In a announcement at CES, the company noted that "the ray tracing hardware in the GR6500 opens the door to many advanced graphics algorithms that have previously been out of reach on all but highest end desktop GPUs consuming hundreds of watts." The new architecture (depicted above) was first outlined in 2014. The company is now demonstrating an implementation in silicon "working in full speed." The firm also noted that "The GR6500 GPU allows every part of the hybrid Unity game engine to run concurrently on the same GPU. 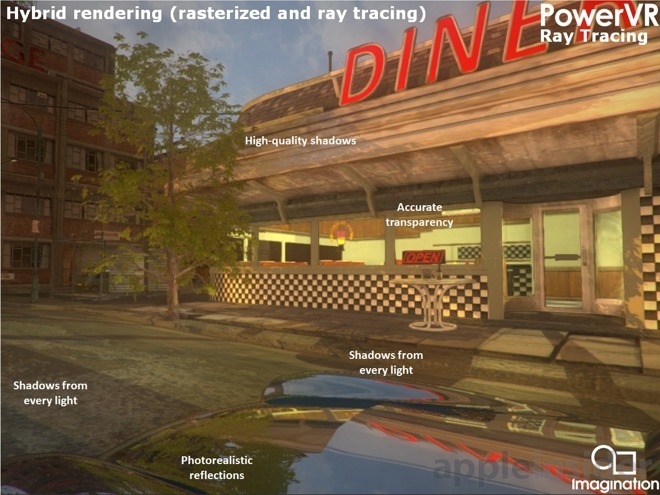 Both the raster and ray tracing passes are executed simultaneously and data flows efficiently through the rendering pipeline keeping costly context switches and power hungry memory traffic to an absolute minimum." 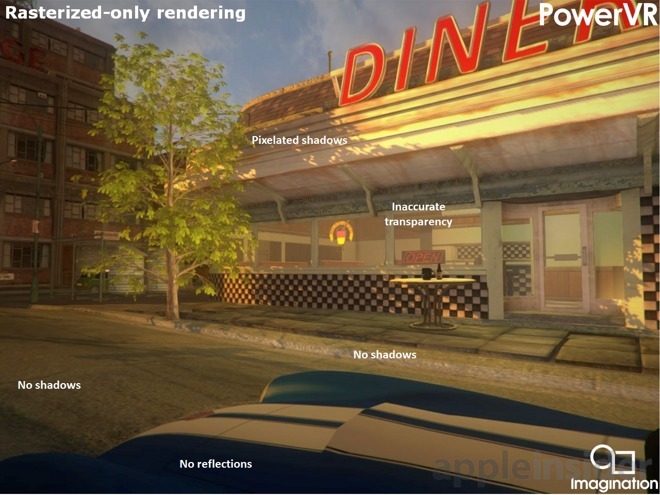 Compared to conventional 3D rendering (above) that builds elements in a scene as a series of shapes, ray tracing technology enables a graphics processor to calculate the particle physics of lighting sources and their reflections illuminating a scene and casting shadows (below), transforming a basic computer 3D rendering into a photorealistic image. Ray tracing can greatly simplify the process of creating a realistic 3D scene by doing the heavy lifting of calculating how objects of different materials would look. However, the amount of processing power required to calculate the billion rays per second calculations required to perform fluid, ray traced 3D has typically necessitated powerful workstations. Being able to perform this on a mobile devices is an emerging breakthrough, particularly given the interest in Virtual Realty and Augmented Reality. Imagination says its existing PowerVR GR6500 chip "die size, GFLOPS performance, bandwidth requirements and power consumption mean that it is comparable to the GPUs already available in smart phones today,"
The company also says its PowerVR Ray Tracing technology "is fundamentally scalable and the efficiency actually increases as we move to more and more powerful cores." While Apple doesn't typically comment on its future roadmap, it has centered its A-series chips around the PowerVR graphics it has been using in iOS devices since the iPhone first appeared. The iPhone's GPU-accelerated user interface was a major part of its jaw dropping introduction and epic launch in 2007. Other smartphone platforms, including Google's Android and Microsoft's Windows Mobile, failed to recognize the value of a GPU-enhanced user experience for years, setting Apple's products apart while the competition delivered a stuttering, laggy UI. Apple continued to make the GPU a prominent part of its iPhone and later iPad introductions, aggressively adopting new graphics technologies as they emerged. Apple also purchased a 3 percent stake in Imagination Technologies in 2008, increasing its share to 9.5 percent the following year. In 2011, Imagination began licensing its new PowerVR Series6 "Rogue" architecture, which Apple adopted in its 2013 A7 and used as the architectural platform for its Metal graphics framework and shader language. The pace of Apple's CPU and GPU development have since accelerated, meaning that it potentially could adopt Imagination's latest technology for iPhone 7 and make ray tracing a core feature in iOS and upcoming iPads and Apple TV.